Alabama regulations (ADEM Admin. Code 335-7-5-.10) require that all community and NTNC water wells be logged by a geologist and that the geologic log is required as part of the permitting process for the well. While this may seem like an additional burden or an un-necessary cost, properly done, it is extremely beneficial to have an experienced professional geologist on site while the pilot bore is being drilled (see the note above on East Central Baldwin County's Well #3). Recording a geologic log (i.e. mudlogging) should be a critical component of any groundwater resources project. OAI personnel have 160 hours of formal "mudlogging" classroom training through a subsidiary of Schlumberger. Coupled with this formal training is eight years of mudlogging experience with petroleum exploration wells to depths exceeding 20,000 feet. Since 1994, we have geologically logged over 51,300 feet of water wells for public supply, irrigation supply and industrial supply. Training and experience, OAI offers both for your benefit. Wellsite geologic services are critical whenever drilling activity occurs. In the petroleum exploration field, a wellsite geologist plays a critical part of the exploration process. 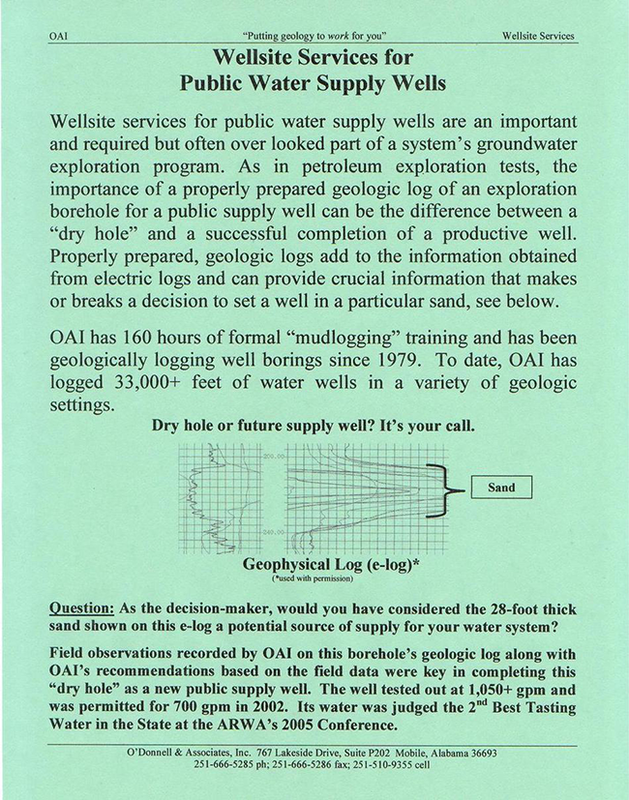 In groundwater exploration, the information provided by a trained, experienced wellsite geologist is no less critical to the success of the project, see green flyer below. OAI has 160+ hours of formal "mudlogging" training and experience performing wellsite geologic services dating back to 1979. Our experience was the difference between a $28,000 "dry hole" with months of delay and a new one million gallon per day public water supply well. The well subsequently went on to receive recognition at the Spring 2005 ARWA Conference in Mobile, Alabama for having the 2nd Best Tasting Water in the State. Note: The 1st place winner that year was a 1.44 million gallon per day public supply well drilled at a location geologically sited by OAI. To make a difference in the case of your next well, contact OAI.